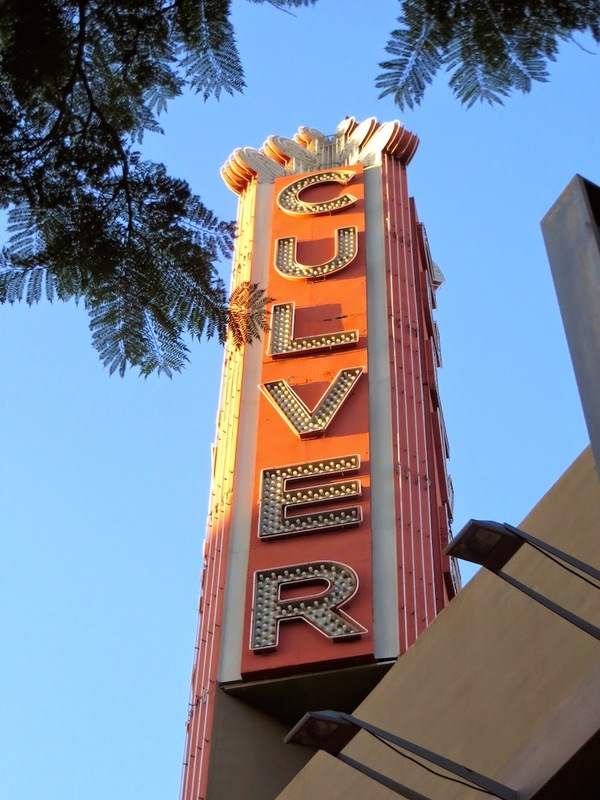 If you can't jet off to Paris for the weekend, then maybe going to Culver City in Los Angeles is the next best thing. They have a Parisian bistro where you can sit on the street and people watch as well some wonderful theaters. This weekend we dined at the above mentioned bistro, fittingly named Meet Me in Paris, and then ventured to the Kirk Douglas Theatre to see a David Mamet play called Race. Knowing in advance that we would be dinning at the Bistro, I wore my Parisian finest in the form of my J. Crew French print popover. Below are a few glimpses of Culver City's City Hall. It is a new building which makes some nods to the historical architecture of the city's past. On to the French cuisine! Meet Me in Paris seems to be known for it's muscles or "moules". 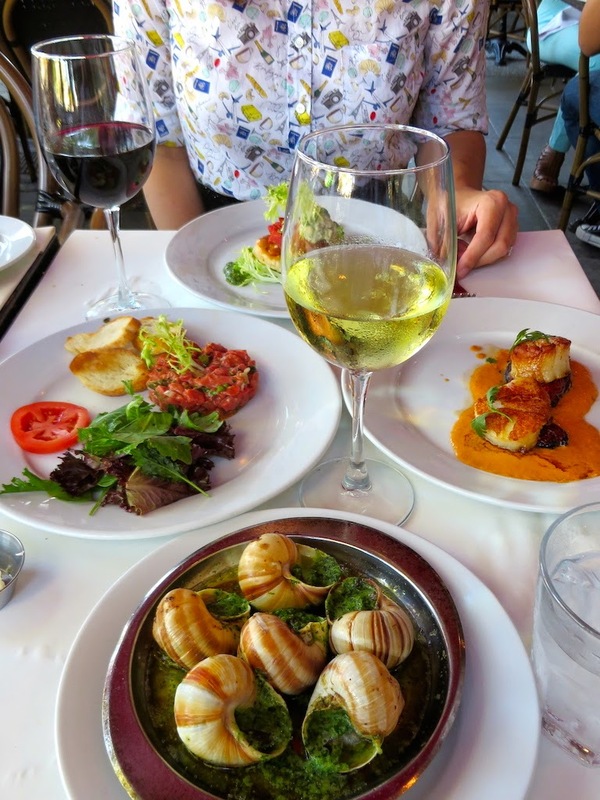 I am not so much a fan of anything that needs to be taken out of a shell to eat, but they did have some other delicious dishes and wine to sample. Did you observe that the escargot is not on my side of the table? Again, that goes back to the whole me not eating things that come from shells. Although I get and appreciate that these are a French delicacy, they look a little too much like what I find in my backyard for my taste. Pom Frites, or French fries are more my style. These have shaved Parmesan cheese and truffle oil, which makes them all the more tasty! Last of all, here are a few shots of the Kirk Douglas Theatre, which just celebrated its 10 year anniversary. I've seen several plays here, and it's a great place to take in a play due to the small and intimate feel of the theater. David Mamet's Race was no exception. I hear you on the snails. I tried them once.. no thanks! Ahh, French bistros. 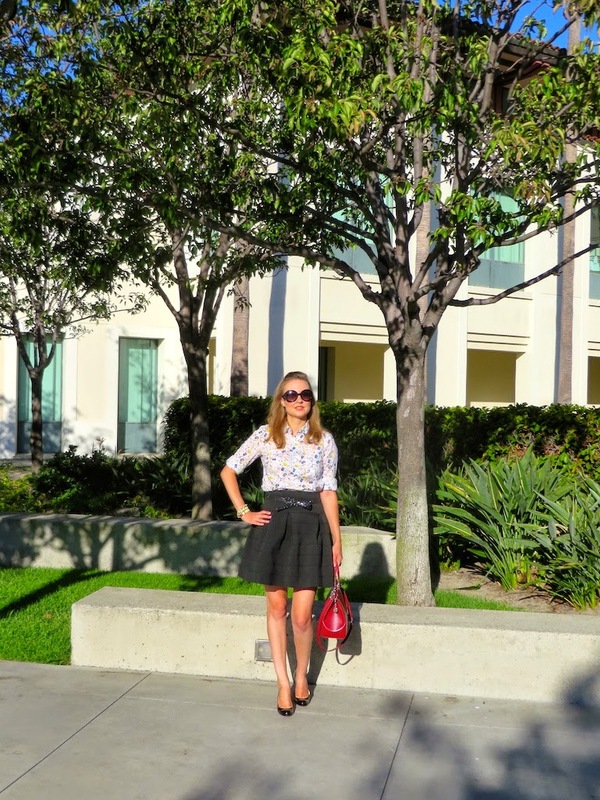 I dig that you wore your J Crew french popover! I seriously don't get why anyone would eat them! My husband only likes them because they are covered in butter. However, French bistros are still so cute and fun! The food looks amazing! Love that adorable outfit and red bag! Thanks Laura! Yes, the food was pretty yummy and delicious! Short Black Skater Skirt - Check. Beautiful Patterned Blouse - Check. Pretty Pumps - Check. Arm Candy - Check. I love everything about this Outfit and would wear it head to toe. You look gorgeous. This place and the photos are beautiful too, plus some yummy food. P.S. You have become one of my favorite bloggers currently. J'adore your style. I would never have known you weren't in Paris! You definitely look french-chic and that bistro reminds of my time there. You look amazing! I wish I was in Paris! This small spot in Culver City definitely brought back some Parisian memories for me too, but nothing beats the real thing! Such a cute post! Love this top! Thank you Jacquline! I get so much wear out of this top, it's one of my favorites! You are so cute! I love that top! Thank you Darcy! I appreciate you stopping by to check out my little Parisian adventure! You look so cute and chic and those fries look amazing! Thanks Marrie! The fries were amazing, especially with the cheese and truffle oil! Thank you for stopping by!